I'm keeping a Dialogue journal with each one of my students. We write letters back and forth to each other every week. I use them as a way to connect with my students in a way that I normally don't have the time for within the school day. It's also good writing practice for them, and gives them the space to write about whatever they want, ask questions, and tell me more about who they are. 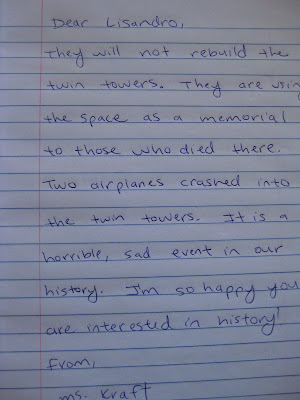 One of my students was flabbergasted when we talked about what happened on September 11th. We read a picture book called "September Roses" which focuses more on how people came together after the tragedy, and we talked about why something like that happened in America. 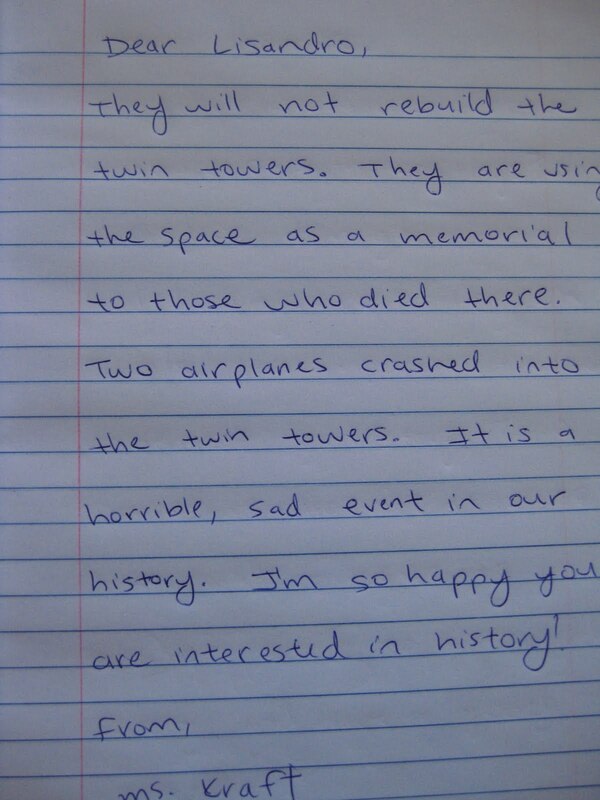 That was a few weeks ago, and he's still writing about it in his Dialogue journal and asking me questions. We have an ongoing dialogue about that in his journal. It's most important function is that my students feel they are heard in their dialogue journals. They write to me about what is going on in their lives, and I am able to listen and write back. If they told me the same stories on the way to P.E. I wouldn't be able to listen as well because my mind is always on 20 different things at any given point in the day. It's an effective and fun tool that I plan to keep going the whole year! And it makes writing fun, the way it should be. I love this idea. What a great way to get kids excited about writing and have them express themselves positively all at the same time. Keep up the great work Mandy!